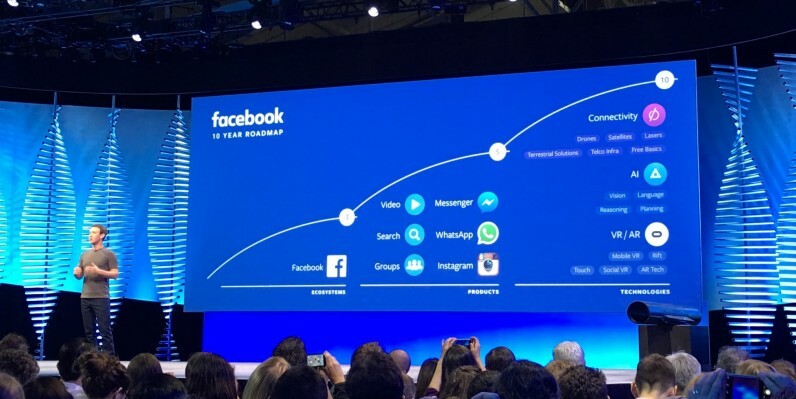 At its F8 conference today, Facebook discussed its current roadmap for the next 10 years. It’s divided into three main sections: improving Facebook proper over the next three years, strengthening Instagram, WhatsApp, Messenger and other products over the next five years, and developing virtual reality, AI and worldwide connectivity over the next 10 years. Though the event is still unfolding, Facebook – like Microsoft – emphasized the importance of bots in the coming years, announcing the Messenger Platform API for businesses to build their own virtual assistants. Interestingly, the company also mentioned plans for augmented reality, when so far its only focused on virtual reality with its Oculus products. The company said future headsets would be the size of a normal pair of glasses and would be able to handle augmented and virtual reality at the same time. The company also reinforced its efforts to ‘connect the world,’ including releasing a simulator for its Free Basics program. Zuckerberg also showed off part of the company’s drone airplane, which uses lasers to bring the Web to places with poor connectivity. Still, the roadmap is mostly made up of things we already knew the company was working on, but Facebook’s sure to reveal more specifics over the course of F8.